A leopard on the loose is bound to cause panic, but these photos and videos are proof that when in fight mode the human wil do anything to survive. The feline creature was on the prowl for several hours in Jalandhar in India, attacking inhabitants before being tranquillised. At least four people were mauled to the ground and bitten, AFP reports. The photos and videos, which have since gone viral, showing crowds gathering to watch the leopard as it tried to maul inhabitants of the Indian city. Reports suggest that most of those who had been hurt were curious onlookers who were unfortunate to have then been attacked the by the leopard. The leopard was spotted pulling a man to the ground, gnawing at his arm before leaping over a wall. It appears wildlife officials initially tried to capture the animal using nets but later switched to tranquiliser guns. When the animal was eventually sedated and captured, it was taken to the Chhatbir zoo. 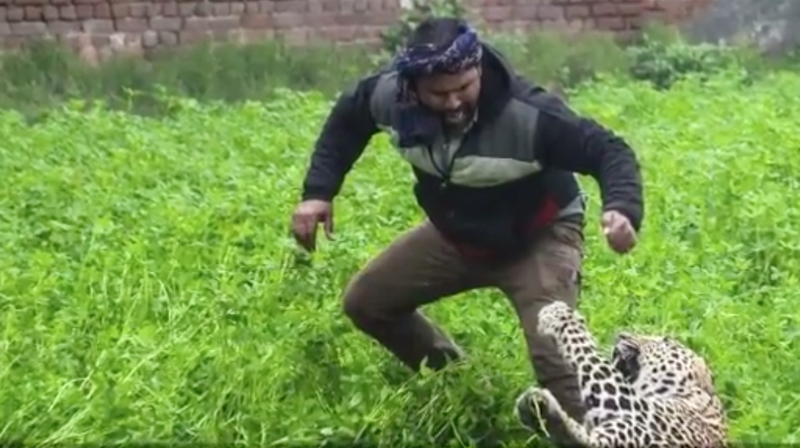 A leopard chases Jalandhar city residents after attempts were made to capture it. It took at least three tranquilizer darts and over nine hours to subdue the cat, local reports say.